Superintendent Hallac will provide brief remarks at next Tuesday’s new bridge ribbon cutting ceremony. The ribbon cutting event will start at 2:00 p.m. at the south end of the Oregon Inlet Fishing Center (8770 Oregon Inlet Road, Nags Head). 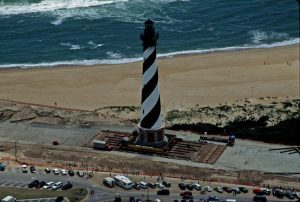 On the morning of Sunday, March 24, Seashore staff discovered damage to multiple signs along NC-12 near the Sandy Bay Day Use Area (between Frisco and Hatteras). Damaged signs included a North Carolina Department of Transportation speed limit sign, a National Park Service (NPS) Sandy Bay parking area sign, and multiple NPS resource protection signs. For more information, click here. Visitors can sign up for ocean safety text messages by texting “Join OBXBeachConditions” to 30890. Once daily rip current forecasts are available again, they will be posted to the park’s Facebook page and beach access page.